February | 2016 | Cooking is Fun … Really!! 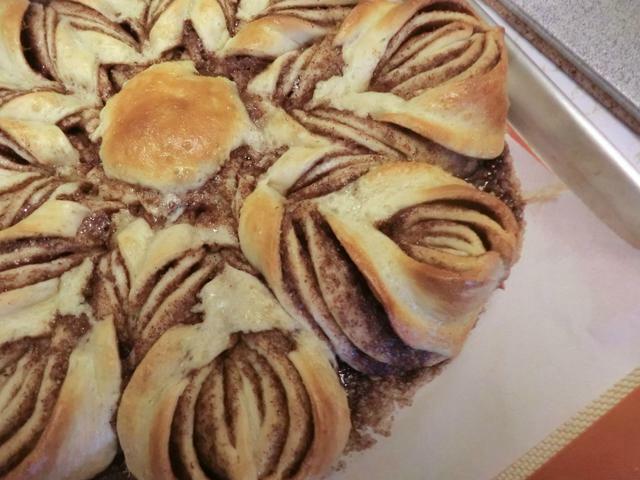 I’ve been seeing these star breads on various blogs for ages, but they were always filled with Nutella. And, Nutella is pricey. 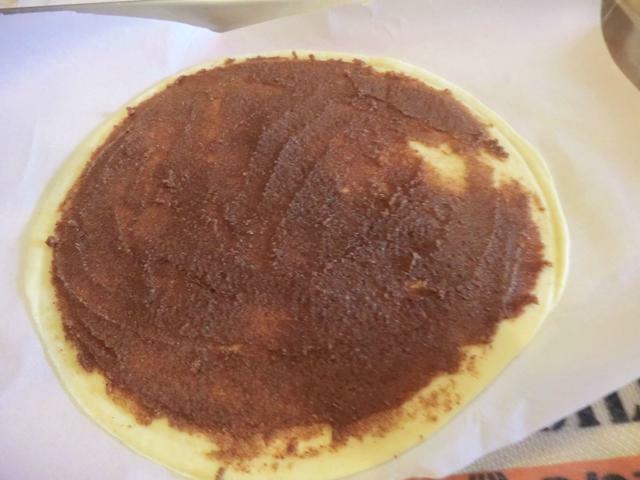 So, I went with a cinnamon, sugar and softened butter filling instead. I used the recipe found here. 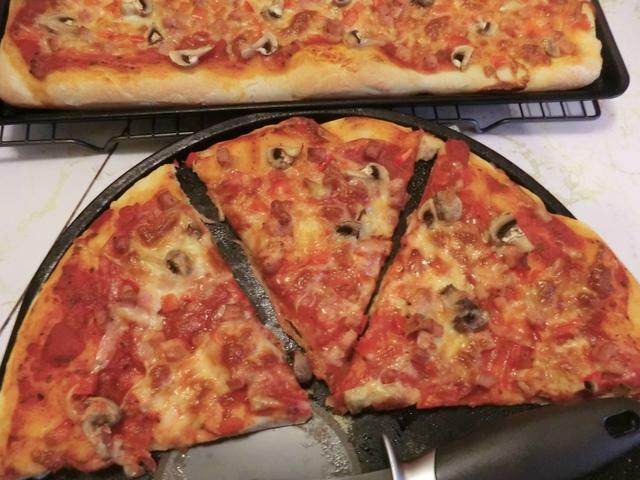 The technique is quite simple but the presentation is impressive. 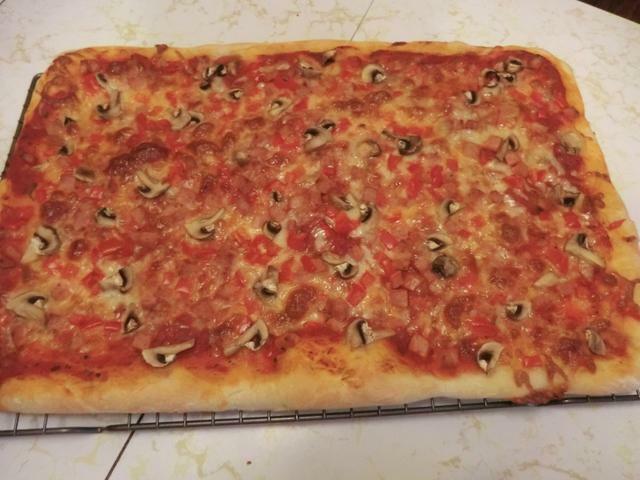 I’m not totally happy with the dough so I’m going to keep looking for a recipe that I like better. 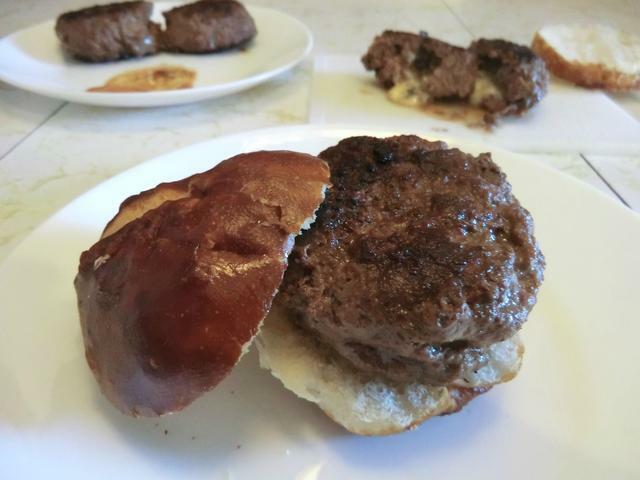 Burgers … fast, inexpensive and tasty even when you don’t grill them. 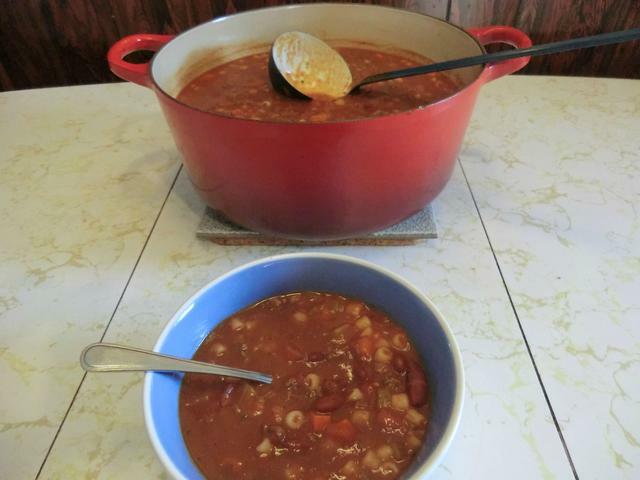 I neglected to freeze the rest of a recent extra lean ground beef purchase, because I was planning on making chili as well as the ‘pasta e fagioli’ that I posted a while ago. Of course, something came up and then I ran across the last of the Stilton blue cheese from my Christmas dinner. 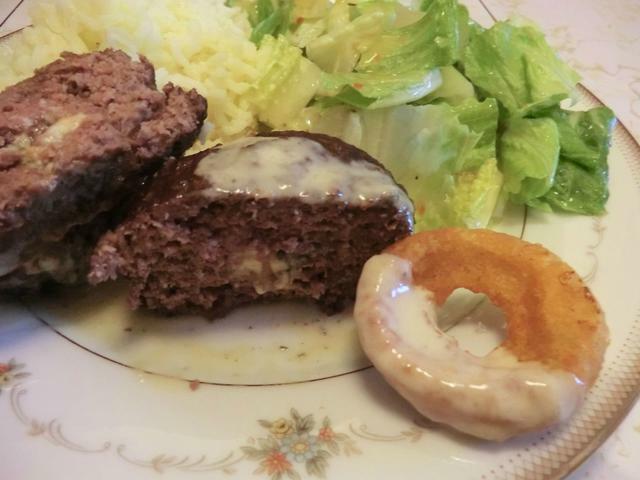 After a fast google search I decided to make stuffed burgers using an Emeril Lagasse recipe I found. 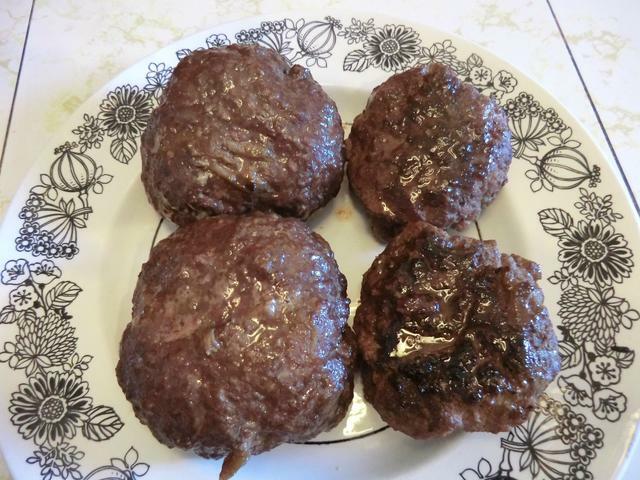 And then I forgot to put in the essence the recipe called for so I ended up with fairly boring burgers. Though I DID add a couple of tablespoons of caramelized onions to the meat along with some salt and pepper. 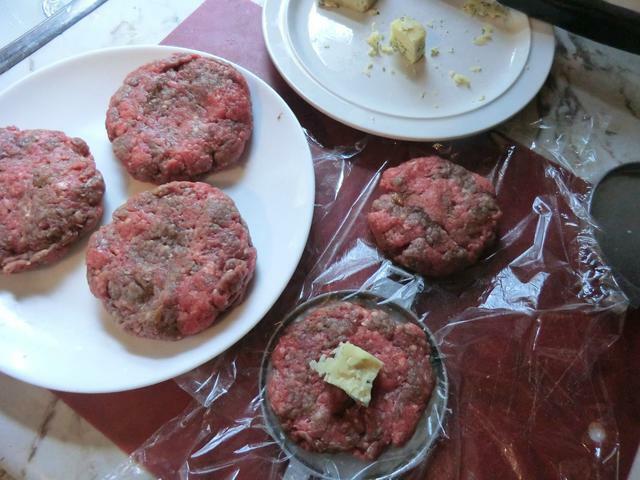 The stuffed burgers called for making 4 quarter pounder patties and then pairing them up with the cheese sandwiched between. The result was 2 HUGE stuffed burgers. 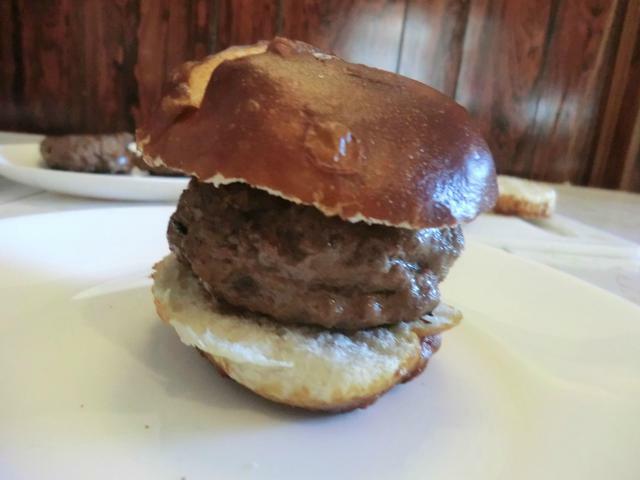 The second pound of meat was divided into 8 patties and I made 4 much smaller stuffed burgers which just fit into a couple of pretzel buns from the city market. 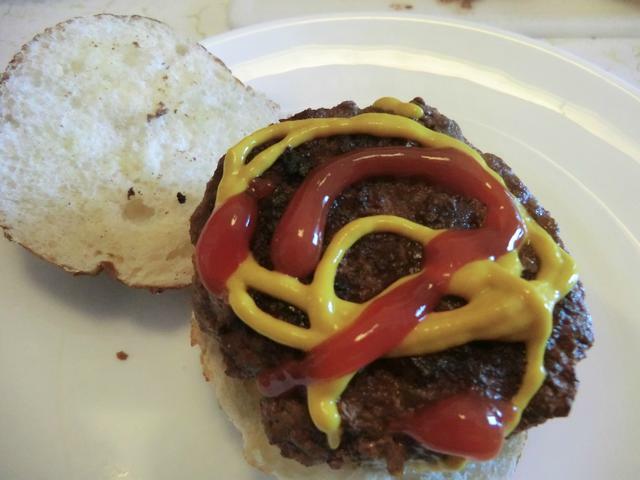 Instead of the fancy sauce/dressing that Emeril made, I went for fast and easy … ketchup and mustard. Amazing what you’ll do when you’re hungry and want to eat as soon as possible. 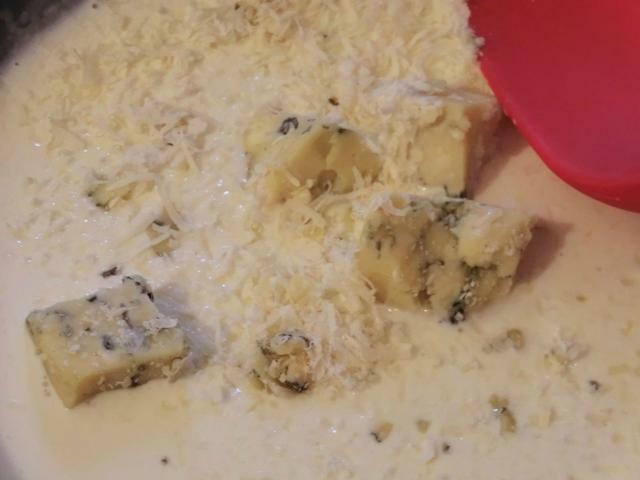 I still had some Stilton left so I made a very simple blue cheese sauce/dip with it … Stilton, whipping cream and grated Parmesan cheese. 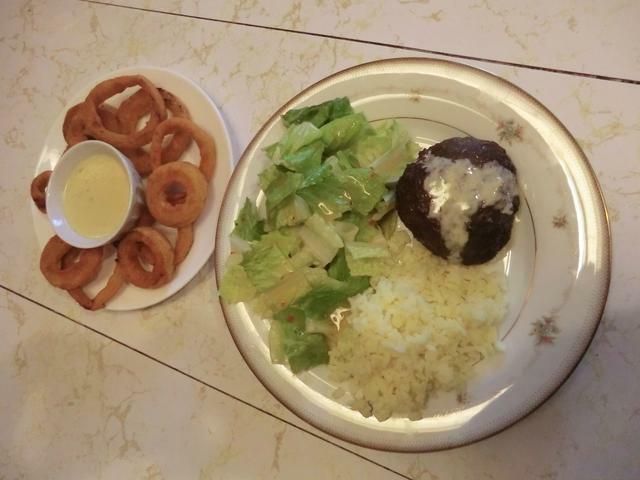 It was great over one of the large burgers which I served with rice and a salad. 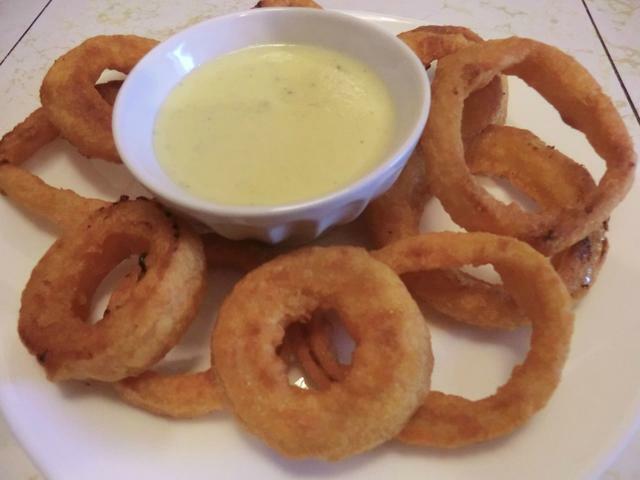 And even better as a dip for onion rings. And here’s a freezer clear-out meal I came up with. 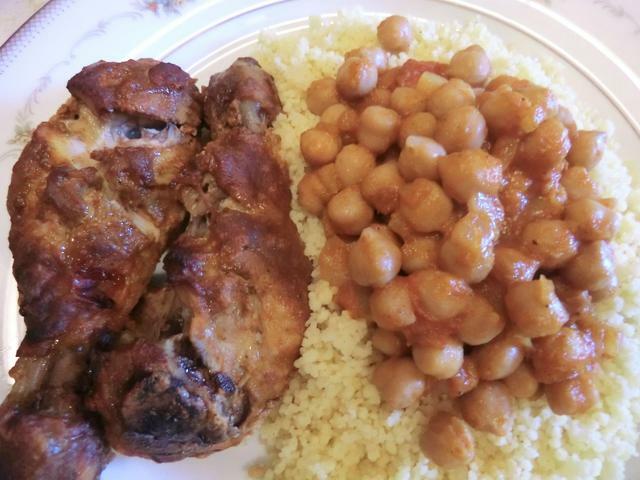 Chicken drumsticks marinated in vindaloo paste/yogurt and served with a side of chickpea curry over couscous. 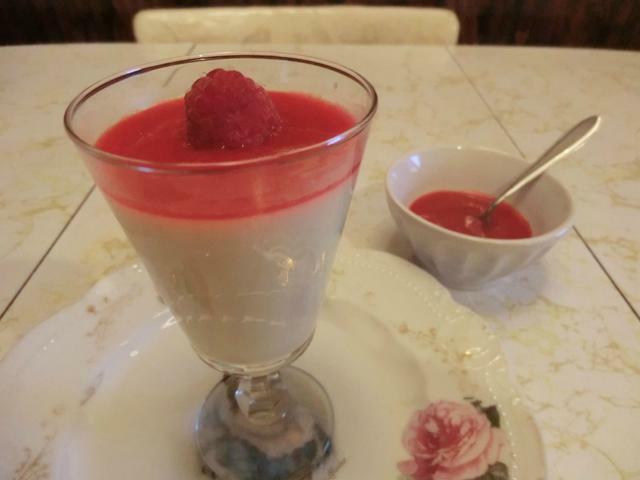 Dessert ended up being the last of the panna cotta with raspberry coulis and no-churn blueberry ice cream. 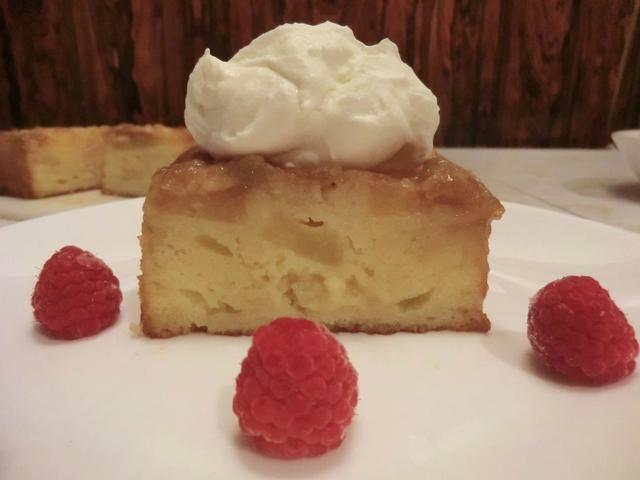 Sometimes I get a craving for something sweet but don’t have a lot of time to invest in making dessert. 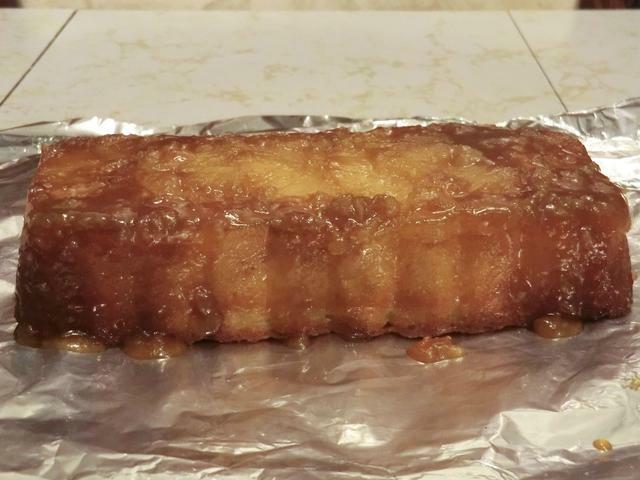 This miniature upside down cake can be baked in a medium sized aluminum foil pan and serves four to five. Preheat oven to 350 deg Fahrenheit. 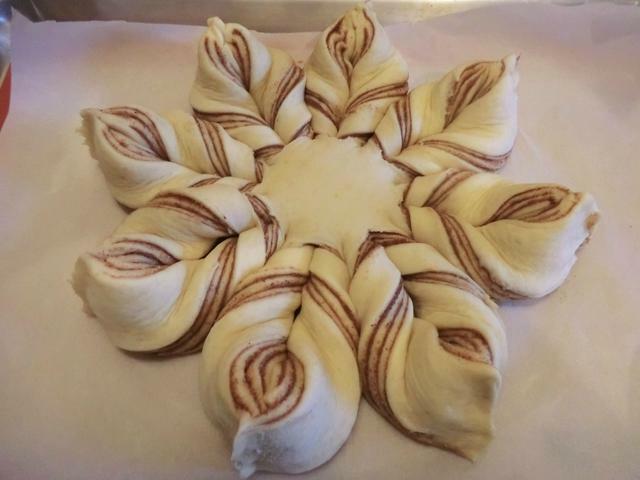 Spray your loaf pan with non-stick cooking spray or lightly butter the bottom & sides. In a medium sized bowl combine the flour, sugar, baking powder, salt, pineapple juice and eggs and whisk together until well incorporated. 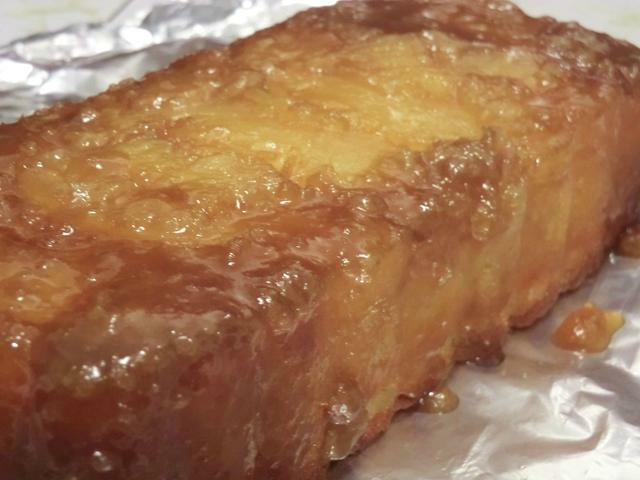 In a small sauce pan, melt the butter, once melted add in the brown sugar and stir constantly on medium heat for 45 seconds, set aside. Add the cherries throughout the chunks, if using. 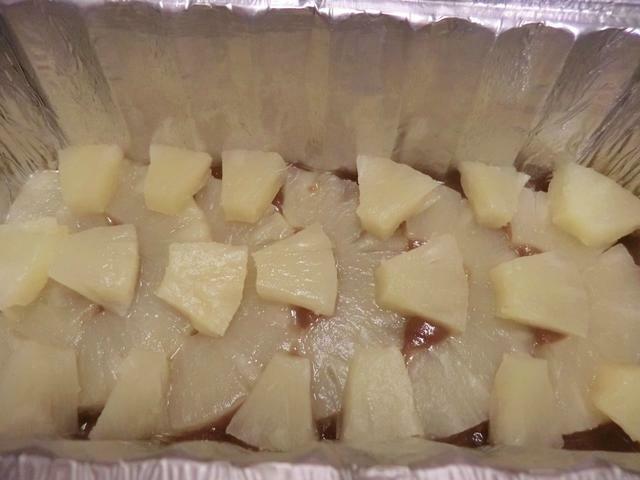 Once baked, remove from the oven and allow to cool in the pan for 10 minutes. Gently run a knife around the edge of the cake to help loosen, because it may stick slightly. Unmold onto a wire cooling rack & allow to cool completely. Do not wrap up while it’s still warm as the inside will get soggy after refrigerating overnight. 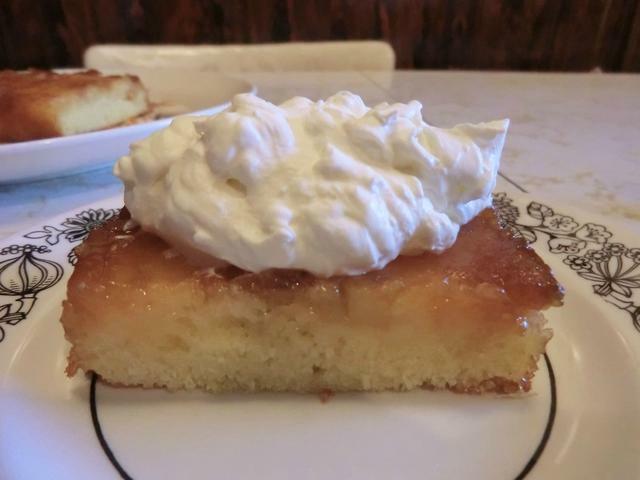 Slice and serve with a scoop of slightly sweetened whipped cream. 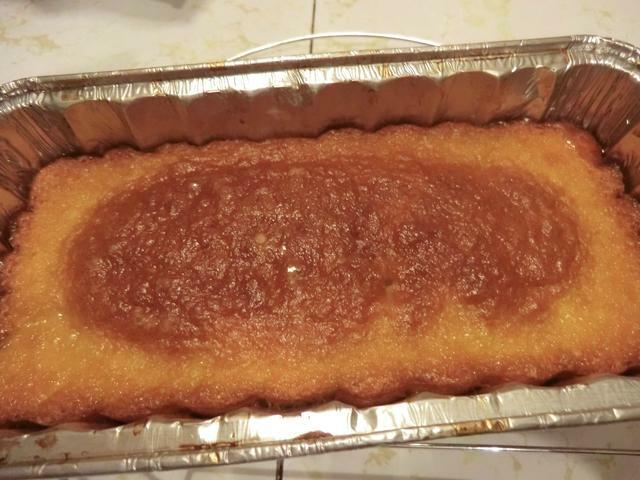 NOTE: The loaf below was made with half the batter so it was much thinner than the regular recipe. 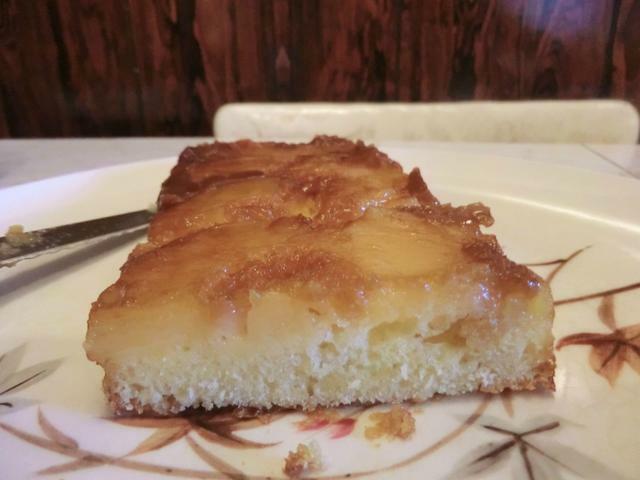 It cooled quickly and the cake remained light and fluffy after storing overnight in the fridge. Not that there was that much to store … I ate half of it the first day and the rest the next. I preferred this thinner version to the one above. 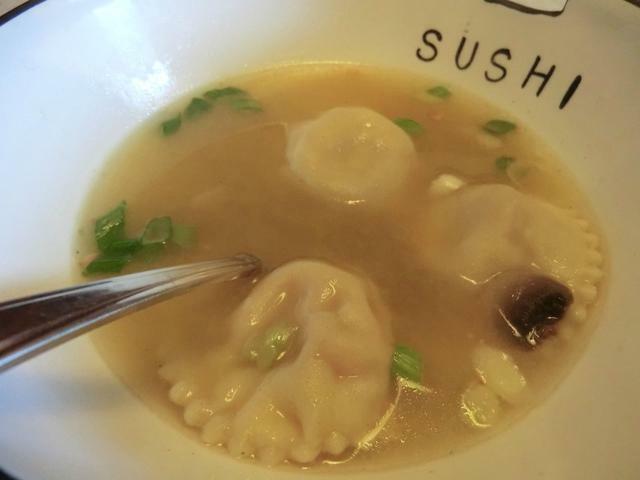 You can whip up a great soup in 15 minutes with a few simple pantry and fridge/freezer ingredients, like this white miso soup with fresh mushrooms and frozen butternut squash ravioli. A sprinkle or two of green onions and you’re all set. Place the miso in a small bowl. Bring the stock to a boil in a medium sized soup pot. Add the soaked seaweed and mushrooms to the pot. Season with about 1/4 tsp of salt and 1/4 tsp ground black pepper. With a ladle, transfer about a cup of the hot liquid to the miso in the bowl and mix gently with a spoon or whisk to dissolve the miso. Add the frozen ravioli to the remaining hot liquid in the soup pot, cover and cook for 5-6 minutes until the ravioli are tender. Take the soup pot off the heat, and stir in the dissolved miso. Taste and adjust salt and pepper as needed. Spoon a couple of cups of soup into each bowl and add 3 ravioli per person. Sprinkle green onion over the top and serve. 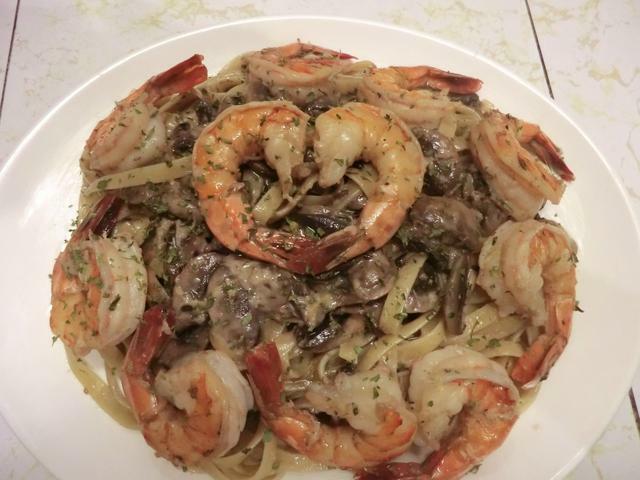 This was going to be a mushroom linguine but as it was Valentine’s Day, I decided to splurge and add some large Black Tiger shrimp to the dish. In large pot of boiling lightly salted water, cook pasta according to package directions until al dente. Reserving 1/3 cup of the cooking liquid, drain. Meanwhile, in large nonstick skillet, melt butter over medium-high heat; saute garlic until fragrant, about 1 minute. 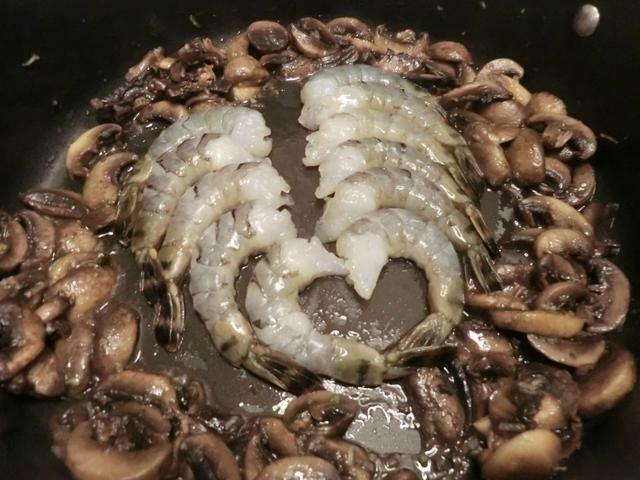 Add (shrimp,) mushrooms and thyme; saute until the mushrooms are softened, about 3 minutes (and the shrimp are red). Stir in pasta, reserved cooking liquid, Parmesan cheese, cream, lemon zest, lemon juice and black pepper; cook, stirring, until sauce is slightly thickened, about 1 minute. Stir in parsley if using fresh. If using dried, reserve 1/2 tsp for garnish. Serve with more grated Parmesan cheese on top if you’d like as well as the dried parsley. 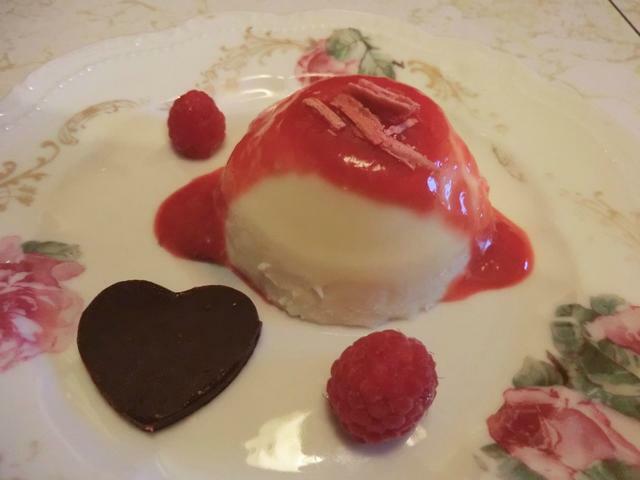 Dessert was a white chocolate panna cotta with a raspberry coulis. 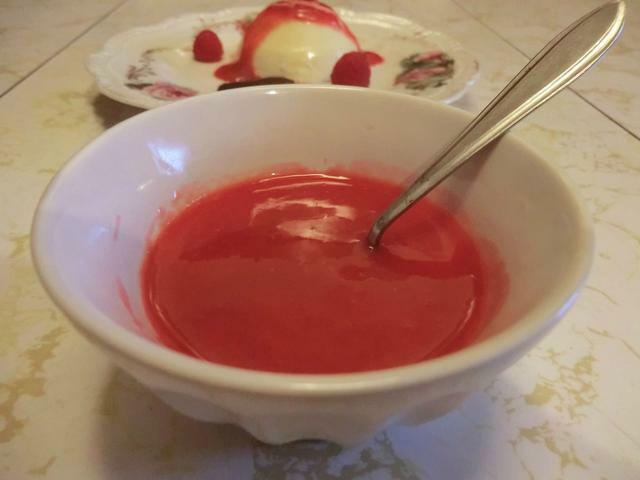 For the coulis, I combined 1/2 cup of raspberries with 1 tbsp of coarse sugar and 1 tbsp of lemon juice, pureed it and then strained out the seeds. 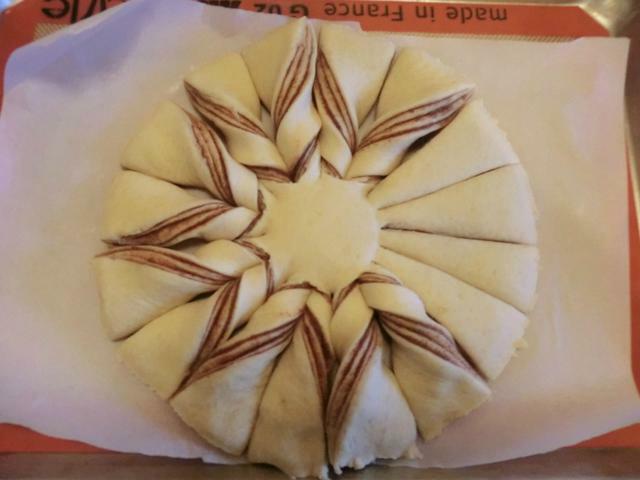 A fast and elegant presentation. I first made this soup 5 years ago. 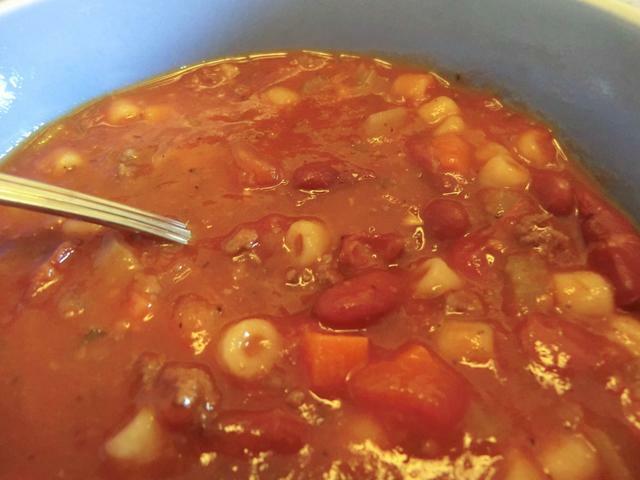 It’s very similar to a minestrone soup in terms of ingredients, but I like this one better as the protein (ground beef in this case though you can use Italian sausage as well) makes it a heartier meal. You can use canned kidney beans for convenience but I prefer cooking my own from scratch. The recipe purports to be a copycat of the Olive Garden soup. I’ve never tasted the original version but this soup is a tasty one and the recipe below makes about 12 cups. ** I used a jar of Classico Fire Roasted Tomato and Garlic spaghetti sauce. Saute beef in oil, in a large 5 qt dutch oven until the beef starts to brown. Add the onions, carrots, celery, and tomatoes. Simmer for about 10 minutes. Drain and rinse beans and add to the pot. Also add beef stock, oregano, black pepper, Tabasco, spaghetti sauce, and pasta. Taste and add salt as desired (~1 tsp). Add chopped parsley. Simmer till celery and carrots are tender (about 45 minutes). NOTE: Make sure to stir all the way to the bottom at least every 7-10 minutes as the ingredients, especially the beef, settle and may stick and burn. If the soup seems too thick before serving, add a bit of water. You may garnish the soup with some grated Parmesan cheese. 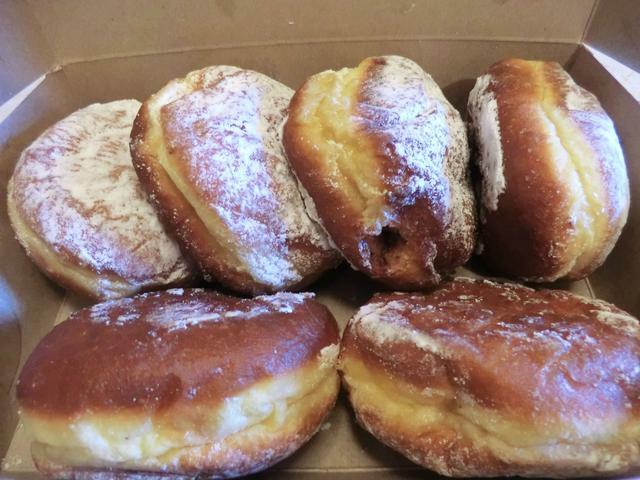 Happy Paczki Day or Fat Tuesday! 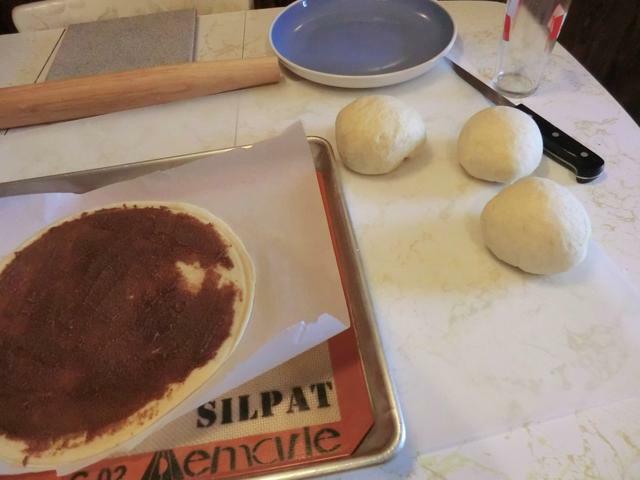 I had a vague impulse to make my own paczki (locally pronounced poonch-key) … but then sanity returned and I picked up a half dozen from the arguably best paczki bakery in town. PS: I didn’t make it. I know it seems like I do a lot of bread baking, but I really don’t. 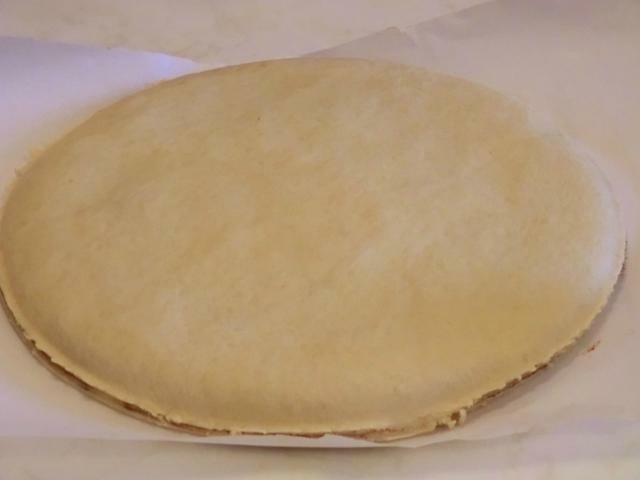 It usually takes me about a year to 14 months to get through a 20kg bag of AP flour between sweet (cakes, pies, cookies) and savoury (breads/buns/rolls, gravies) uses. I’ve been holding back on the last of the flour from my previous purchase … just in case of emergency. Not that I can really imagine what a ‘flour emergency’ would consist of. Still, after picking up a new bag on Saturday, before going off to donate blood, I’m now flour rich. 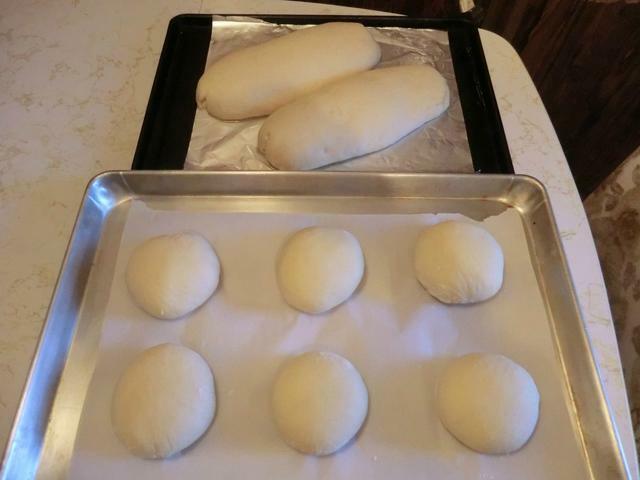 So I baked 2 pizzas on Sunday and tried a new recipe for crusty rolls today. 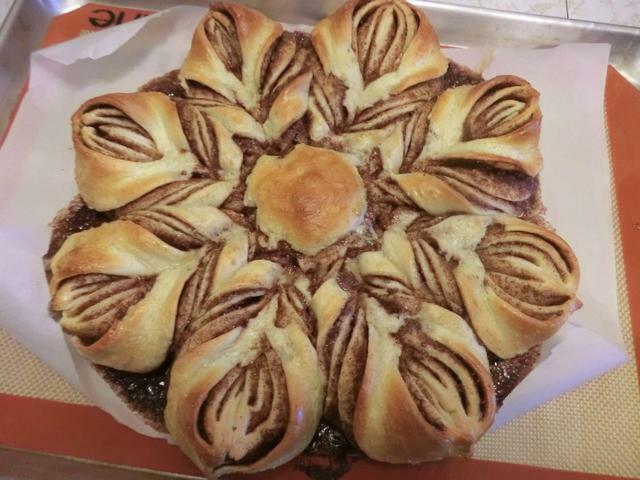 I got the recipe from a FB bread baking group. 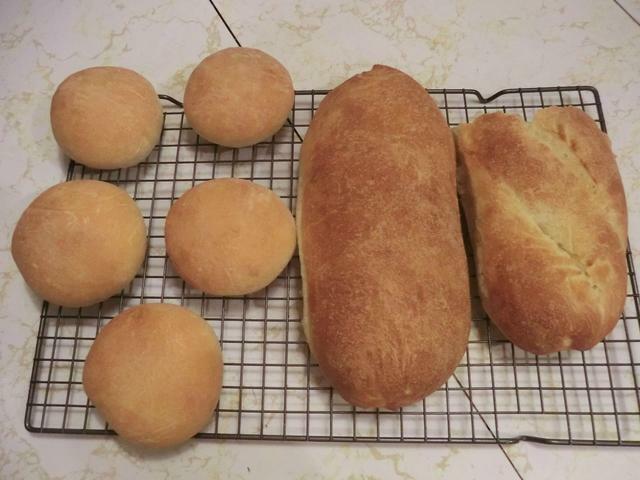 I wasn’t sure that I wanted to make a dozen rolls so I baked a couple of mini loaves with half of the dough, instead. I’m pretty sure I’ve found my go-to crusty roll recipe. 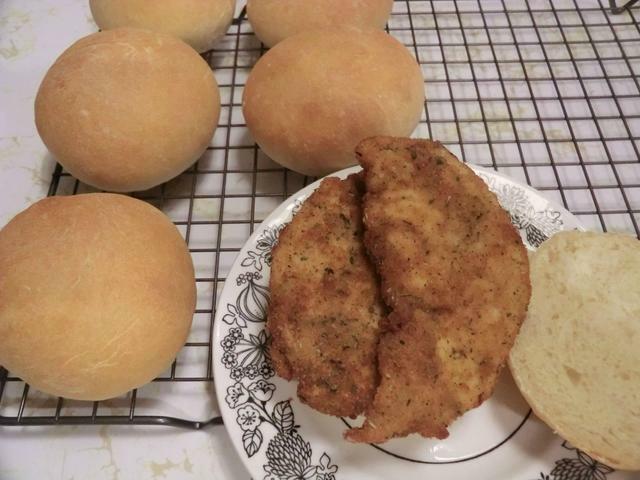 Of course, I had to taste test the rolls so I made a sammie with one filled with a couple of large chicken fingers/small cutlets and a generous slather of Miracle Whip. I wanted to try a higher baking temp (425 deg F) for the loaves so they got over-proved by the time I got them into the oven and there wasn’t a lot of oven spring left in the yeast. I suspected that would happen when I slashed the loaf. In a small bowl, dissolve the sugar in the warm water. Sprinkle the yeast on top. Let sit until foamy, 5-10 minutes. In a large bowl, add 1 cup of the flour and salt and mix togther well. 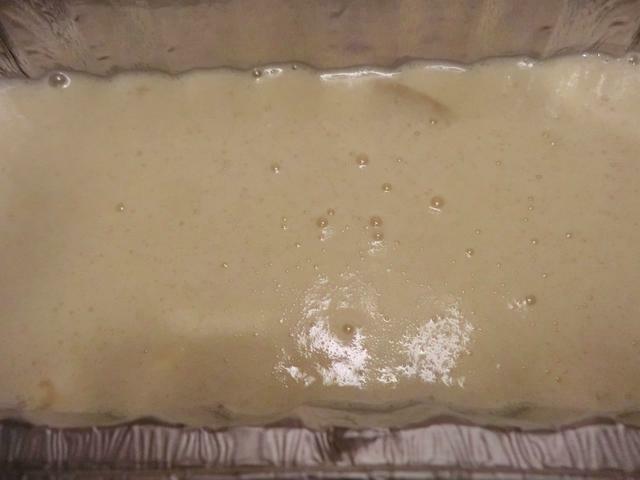 Add proofed yeast mixture, egg and oil. With a wooden spoon, beat well for a couple of minutes. Stir in the rest of the flour, half a cup at a time, reserving about a half a cup for kneading. 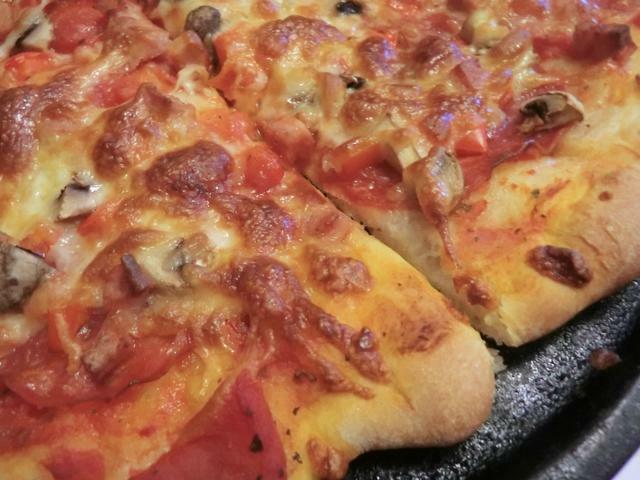 Sprinkle some flour on a working surface and turn out the dough. Knead until you have a soft but not sticky dough. 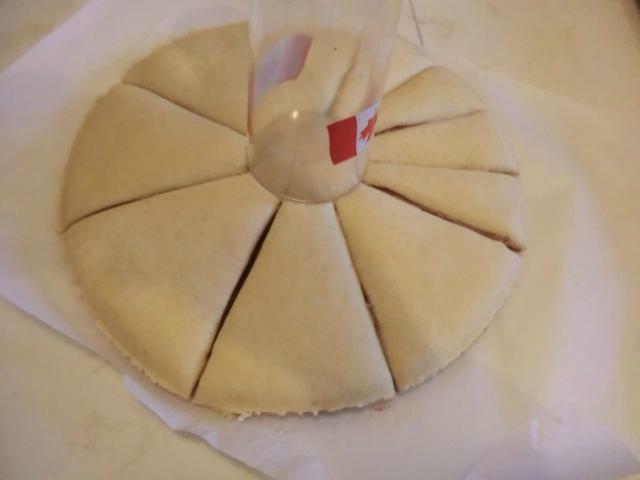 Transfer dough to a greased bowl and let rise for about an hour or until doubled. 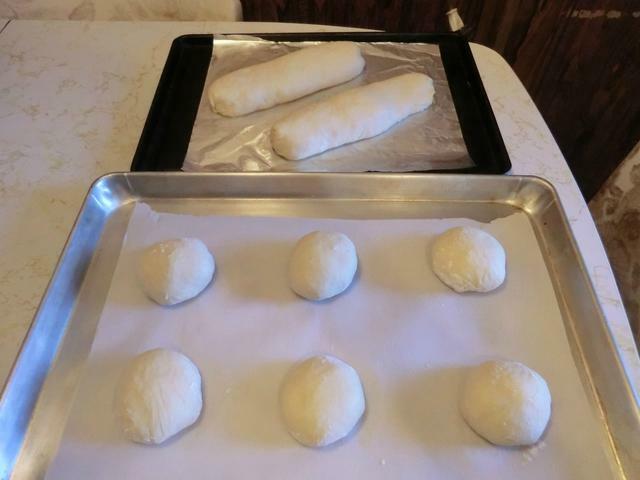 Shape into 12 balls and lay out on a greased baking sheet. 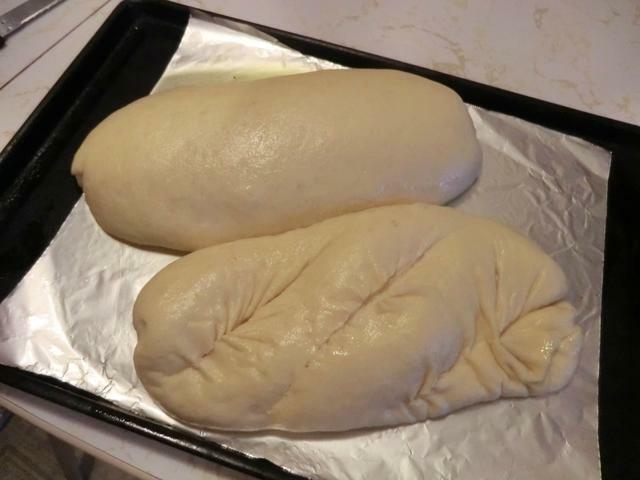 Cover lightly with a towel and let rise for about 40 minutes. 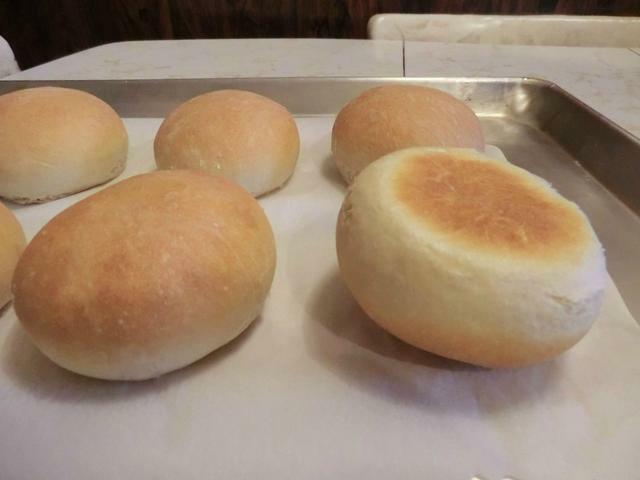 Preheat the oven to 400 deg F and bake rolls for 12-15 minutes. 2 mini loaves, glazed with EVOO, baked at 425 deg F for 20 min.